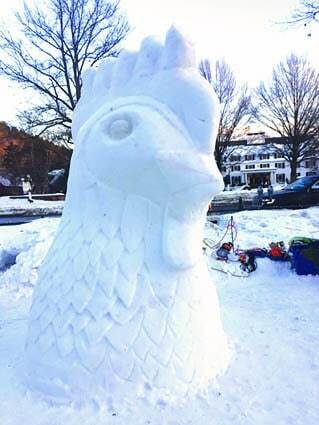 WOODSTOCK—On Saturday, Feb. 18 artists were putting final touches on their sculptures carved out of ice blocks on the Woodstock Green as part of the Vermont Flurry Snow Sculpture Contest. The winter festivities on the Green took place over President’s Day weekend, Feb. 17-19, and was presented by Pentangle Arts Council and ArtisTree Community Arts Center. Spectators had the chance to chat with the professional snow sculpting teams as they worked on their sculptures bringing art to life over the three-day period. Spectators were also asked to vote for their favorite “Peoples’ Choice” pick, which was “Waddle of Love” (penguins). The judges awarded the “Snow Bear” first place; “Tea Rex” second place; and “Pop Goes the Weasel” and “Flowers of Life” third place. This event is part of Vermont Arts 2017, a year-long celebration highlighting the stunning array of arts events — concerts, festivals, exhibits, and openings — that take place all across the state.